Today's tip: an old friend, the Turkish Bed Sock from Churchmouse Yarns and Teas. I know, this photograph wins the award for world's most bland colouring, Blog category. It was cloudy yesterday when I finally emerged from housecleaning mode*, what can I tell ya. There's nothing in that picture to give you scale, but the proportions should be a clue. The slipper is small. And you don't need to felt it, which saves you time/stress if you are on a deadline, as is common for we knitters at this point in the game. It's small because the instep doesn't even come all the way up to the ankle, and it's small because it's recommended to be shorter than your foot in order to stay snug and not fall off. This is a paid pattern so I won't give away how much shorter. 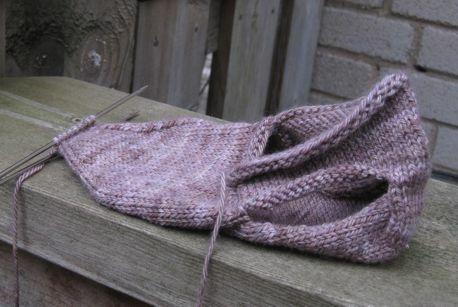 But in knitting terms, it's a not-insignificant amount of time savings over a full sock, and your recipient may can actually wear them as a sock in certain styles of shoe. So you look awesome and generous, and you can be fairly relaxed about it all. * I had to clean the house to make space for the Christmas tree, and I thought I might knit faster if I had that constant reminder of how imminent Christmas is. So far, so good.